Our braided harness cords are manufactured exclusively of high-tenacity Polyester. They are antistatic, abrasion resistant and thermo fixed. Upon request individual colours can be supplied. All harness cords can be supplied with or without inner core, with or without carbon. 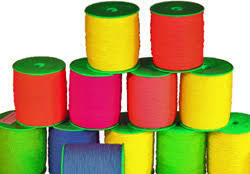 We are able to produce various types and colors depending on the customer's request. Our harness cords for waterjet weaving machines absorb no humidity due to our special "water repellent" finishing treatment.